The New York Yankees today announced that outfielder Slade Heathcott is the recipient of the 2015 James P. Dawson Award, given annually to the outstanding Yankees rookie in spring training. Heathcott received the award in a pre-game ceremony today, prior to the Yankees' 1:05 p.m. game vs. the Nationals at George M. Steinbrenner Field. Heathcott, 24, batted .355 (11-for-31) 12R, 2 doubles, 1 triple, 1HR and 7RBI in 21 games this spring and was tied for fourth in the Grapefruit League in runs scored. Over parts of six minor league seasons, the Texarkana, Tex., native has batted .268 (318-for-1,187) with 69 doubles, 20HR and 126RBI. 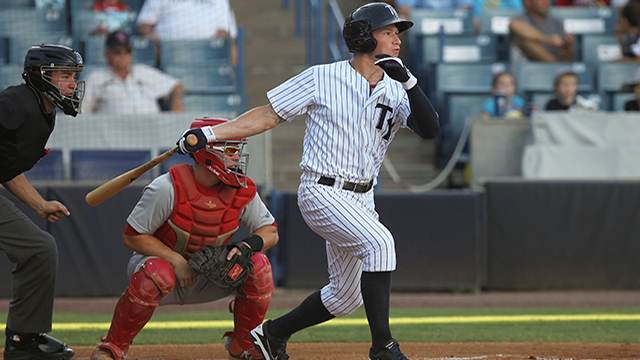 Heathcott was originally selected by the Yankees in the first round (29th overall) of the 2009 First-Year Player Draft. Two winners of the honor, Tony Kubek in 1957 and Tom Tresh in 1962, went on to win the American League "Rookie of the Year" Award. The award first was presented to rookie Norm Siebern by Manager Casey Stengel in St. Petersburg, Fla., at the conclusion of spring training in 1956. New York Yankees beat writers vote on the winner. In conjunction with the award, Heathcott will receive a watch from Betteridge Jewelers.